The penultimate deglaciation (~ 138–128 ka), which represents the transition into the Last Interglacial period, provides a framework to investigate the climate and environmental response to large changes in boundary conditions. Here, as part of the PAGES-PMIP working group on Quaternary Interglacials, we propose a protocol to perform transient simulations of the penultimate deglaciation as well as a selection of paleo records for upcoming model-data comparisons. The Roosevelt Island ice core was drilled to investigate climate from the eastern Ross Sea, West Antarctica. 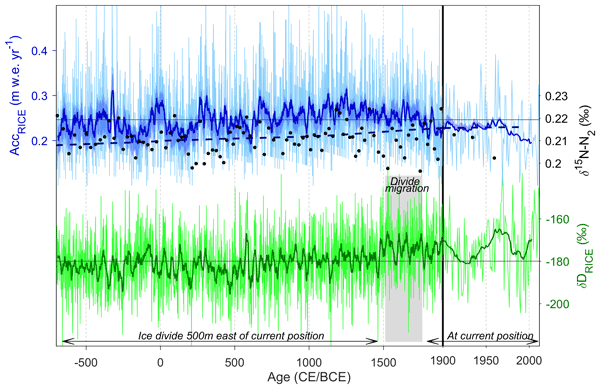 We describe the depth-age scale of the ice core for 343–763 m (2635–83 000 yr b1950). Old ice near the bottom of the core implies the ice dome existed throughout the last glacial period and that ice streaming was active in the region. Variations of methane, similar to those used as evidence of early human influence on climate, was observed prior significant human population. Climate models forced only with greenhouse gas concentrations and orbital parameters representative of the early Last Interglacial are unable to reproduce the observed colder-than-present temperatures in the North Atlantic and the warmer-than-present temperatures in the Southern Hemisphere. Using a climate model forced also with a freshwater amount derived from data representing melting from the remnant Northern Hemisphere ice sheets accounts for this response via the bipolar seesaw mechanism. Using climate model experiments, we investigate the causes of the Eemian (125 000 years ago) warming in Greenland. Sea ice loss and sea surface warming prolong the impact of the summer insolation increase, causing warming throughout the year. We find potential for ice sheet mass loss in the north and southwestern parts of Greenland. Our simulations indicate that the direct impact of the insolation, rather than the indirect effect of the warmer ocean, is the dominant cause of ice sheet melt.